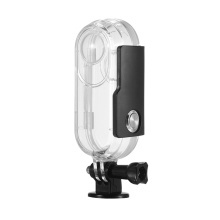 Camera waterproof housing specially designed for Insta360 ONE action camera. Waterproof depth is up to 30m, with it you can take wonderful photo underwater using your Insta360 ONE. Durable and sturdy plastic material with rubber waterproof ring, Impact-resistant and dust-proof. Standard 1/4 inch thread make it easy for you to use the housing with various accessories such as selfie stick/tripod. Every time you use the waterproof housing, please inspect it thoroughly and verify that it&apos;s operating properly.